In our latest post, our Executive Director Melissanne Scheld sits down with Dryad’s Board of Directors Chair, Professor Charles Fox, to discuss challenges researchers face today, how Dryad is helping alleviate some of those pain points, why Dryad has had such staying power in a quickly changing industry, . . . and then we move on to dessert. Can you tell us a little about your professional background and how that intersects with Dryad’s mission? I wear two hats in my professional life – I am an evolutionary ecologist who studies various aspects of insect biology at the University of Kentucky, and I am a journal editor (Executive Editor of Functional Ecology). My involvement with open data and Dryad began fortuitously in 2006. The British Ecological Society was invited to send a representative to a Data Registry Workshop, organized by the Ecological Society of America, to be held that December in Santa Barbara, California. I am (and was at that time) an editor of one of the British Ecological Society’s journals, Functional Ecology, and I live in the U.S. So Lindsay Haddon, who was Publications Manager for the BES, asked me to attend the workshop as their representative. Before that meeting I don’t recall having thought much about open data or data archives, but I was excited to attend the meeting in part because the topic intrigued me and, selfishly, because my parents live in southern California and this was an opportunity to visit them. The discussions at that meeting, plus those at a couple follow-up meetings over the next couple years, including one at NESCent in Durham, North Carolina, and another in Vancouver, convinced me that data publishing, and open data more generally, should be a part of research publication. So I began lobbying the BES to adopt an open data policy and become a founding member of Dryad. I wrote a proposed data policy – just a revision of the Journal Sata Archiving Policy, JDAP, that many ecology and evolution journals adopted – and submitted that proposal to the BES’ publication committee. It took a few years, but in 2011 the BES adopted that data policy across their suite of journals and became a member of Dryad. The BES has since been a strong supporter of open data and required data publication as a condition of publishing a manuscript in one of their journals. Probably because I was a vocal proponent of data policies at BES meetings (along with a few others, most notably Tim Coulson), I was nominated to be a Dryad board member, and was elected to the board in 2013. As an educator, what are some of the biggest changes you’ve seen in the classroom during your career? When I started teaching, first as a graduate student (teaching assistant) and then as a young university professor, we didn’t have Powerpoint and digital projectors. So I made heavy use of a chalkboard (or dry erase board) during lecture, and used an overhead projector for more complicated graphics. Students had to take detailed notes on the lecture, which required them to write furiously all throughout the class. Nowadays I produce detailed PowerPoint slides that include most of the material I cover, so I write very little on the chalkboard. And, because I can provide my slides to students before class – as a pdf that they can print and bring to class – the students are freed from scribbling furiously to capture every detail. Students still need to take some notes (my slides do not include every detail), but they are largely freed to listen to lecture and participate in class discussions. I am not convinced, though, that these changes have led to improved learning, at least not in all students. Having information too easily available, including downloadable class materials, seems to cause some students to actually disengage from class, and ultimately do poorly, possibly because they think they don’t need to attend class, or engage when they do attend, since they have all of the materials easily accessible to them outside the classroom? What do you think the biggest challenges are for open science research today? I have been amazed at how quickly open data has become accepted as the standard in the ecology and evolution research communities. When data policies were first proposed to journals there was substantial resistance to their adoption – journals were nervous about possibly driving away authors, and editors (who are also researchers) shared the views that were common in the community regarding ownership of their own data – but over just a few years the resistance largely disappeared among editors, societies and publishers, such that a large proportion of the top journals in the field have adopted policies requiring data to be published alongside research manuscripts. That said, some significant challenges remain, both on the researcher side and on the repository side. On the repository side, sustainable funding remains the largest hurdle. Data repositories cost money to run, such as for staff and infrastructure. Dryad has been relying on a mix of data publication charges (DPCs) and grants to fund its mission. This has worked for us so far, but constantly chasing grants is a lot of work for those writing grants, and the cost to researchers paying DPCs, albeit small, is not trivial for those without grant support. On the researcher side, though data publishing has mostly become an accepted part of research publication in the community, there remain many important cultural and practical challenges to making open data universally practiced. These include the development of standards for data citation and reuse (not restrictions on data reuse, but community expectations for citation and collaboration), balancing views of data ownership with the needs of the community, balancing the concerns of researchers that produce long-term datasets with those of the community, and others. We also need to improve education about data, such as teaching our students how to organize and properly annotate their datasets so that they are useful for other researchers after publication. Even when data are made available by researchers, actually using those data can be challenging if they are not well organized and annotated. When researchers are deciding in which repository to deposit their research data, what values and functions should they consider? Researchers should choose a repository that best fits the type of data they have to deposit and the community that will likely be reusing it. There are many repositories that handle specialized data types, such as genetic sequence data or data to be used for phylogenetic analysis. If your data suits a specialized archive, choose that. But the overwhelming majority of data generated by ecologists don’t fit into specialized archives. It’s for these types of data that Dryad was developed. So what does Dryad offer researchers? From the perspective of the dataset author, Dryad links your dataset directly to the manuscript you have published about the dataset. This provides users detailed metadata on the contents of your dataset, helping them understand the dataset and use it correctly for future research. Dryad also ensures that your dataset is discoverable, whether you start at the journal page, on Dryad’s site, or any of a large number of collaborator services. The value of Dryad to the dataset user are similar – easy discoverability of data and clear links to the data collection details (i.e., links to the associated manuscripts). You’ve held several roles on Dryad’s Board of Directors – what about this organization compels you to volunteer your free time? My experiences as a scientist, a journal editor, and participating in open data discussions have convinced me that data publication is an essential part of research publication. For decades, or even centuries, we’ve relied on a publishing model where researchers write manuscripts that describe the work they have done and summarize their results and conclusions for the broader community. That’s the typical journal paper, and was the limit of what could be done in an age where everything had to fit onto the printed page and be distributed on paper. Nowadays we have near infinite space in a digital medium to not just summarize our results, but also provide all of the details, including the actual data, as part of the research presentation. It will always be important to have an author summarize their findings and place their work into context – that intellectual contribution is an essential part of communicating your research – but there’s no reason that’s where we need to stop. I imagine a world where a reader can click on a figure, or table, or other part of a manuscript and be taken directly to the relevant details – the actual data presented in the figure, the statistical models underlying the analyses, more detailed descriptions of study sites or organisms, and possibly many other types of information about the experiment, data collection, equipment used, results, etc. We shouldn’t be constrained by historical limitations of the printed page. We’re not yet even close to where I think we can and should be going, but making data an integral part of research publication is a huge step in the right direction. So I enthusiastically support journal mandates that require data to be published alongside each manuscript presenting research results. And facilitating this is a core part of Dryad’s mission, which leads me to enthusiastically support both Dryad’s mission and the organization itself! Those are my two favorite pies, so it’s a tough question. If served a la mode, i.e., with ice cream, then I’d most often pick apple pie. But, without ice cream, I’d have to choose pumpkin pie. Stay tuned for future conversations with industry thought leaders and other relevant blog posts here at Dryad News and Views. 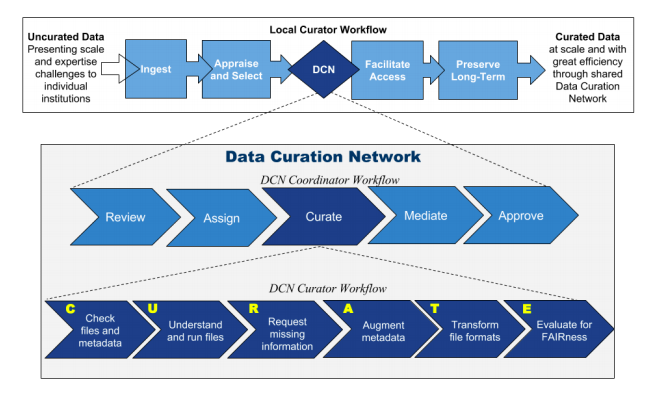 This is the second in a series of blog posts highlighting new guidance from the Dryad curation team. Part 1 covered human subjects data. Part 2, from curator Shavon Stewart, focuses on best practices for sharing data associated with endangered species. Tasmanian devils, mountain gorillas, and black rhinos all have one thing in common. They are listed as critically endangered on the IUCN Red List of threatened species. Data archived in Dryad are publicly available, therefore, potential risks to endangered and vulnerable species must be carefully assessed before submitting data. It is imperative that threatened species remain safe in their natural habitat. Publishing location data and habitat descriptions can expose species to hunters, poachers, and wildlife enthusiasts which can lead to their further decline, as well as hinder conservation efforts. The key is to provide fewer details of the species’ location for those with the intention of doing harm, without overly compromising analyses or replication by other researchers. 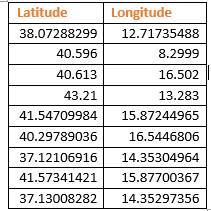 Here at Dryad, we recommend simple actions such as masking coordinates by a few decimal points or removing exact geo-coordinates from the dataset, which can limit illegal access to these vulnerable creatures. 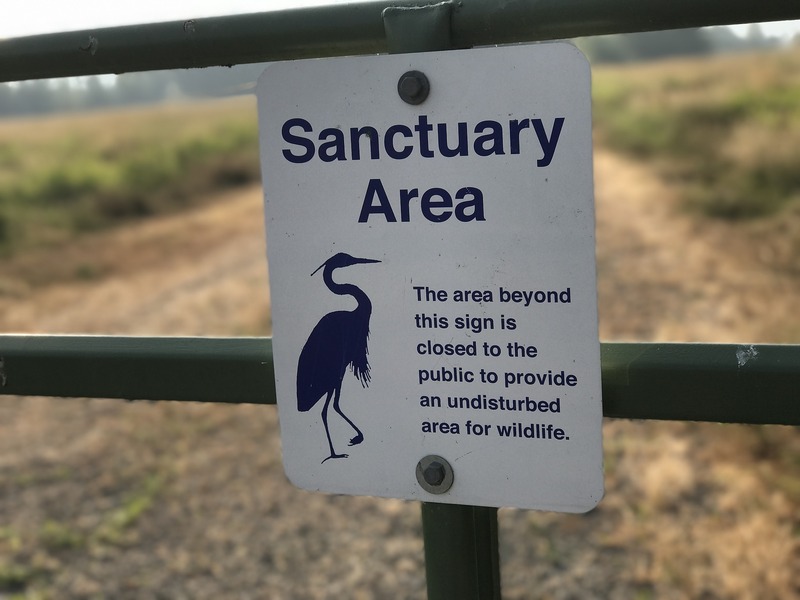 The Endangered Species Act (ESA) and similar organizations offer information on current conservation efforts and programs relevant to the species they are studying. The ESA also provides lists of protected plant and animal species nationally and worldwide. 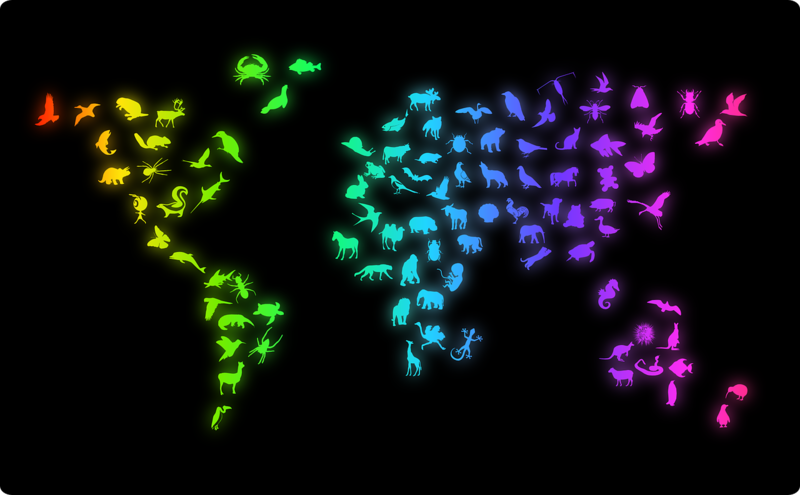 The Global Biodiversity Information Facility’s (GBIF) “Guide to Best Practices for Generalising Primary Species-Occurrence Data” provides some guidance in determining whether sensitive occurrence data should be restricted. 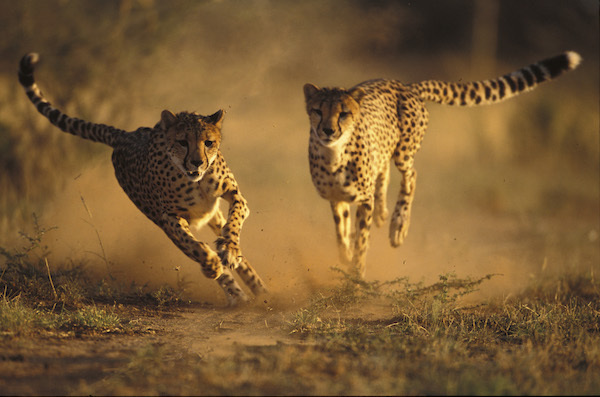 Dryad’s recently added guidance on endangered species summarizes some of this information and includes tips for assessing risk, documentation and otherwise preparing such data to be shared openly. If you’re still uncertain, contact the Dryad curation team! And Now, the Numbers . . .
As the new year begins, we take note of the increasing diversity of fields represented in data archived at Dryad and review the numbers for 2016. 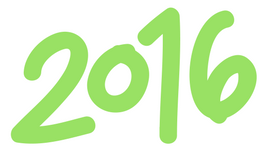 We are excited to see Dryad’s role in the preservation of data expand into new areas and fields in 2016. Researchers submitted more data involving human subjects and data from social media. In addition, a quick look at our most popular data shows that two of the top five downloaded packages were from the fields of cardiology and science journalism. While Dryad’s origins are in the life sciences, it is increasingly being used as a general repository for data from a myriad of fields. Our curators were busy! 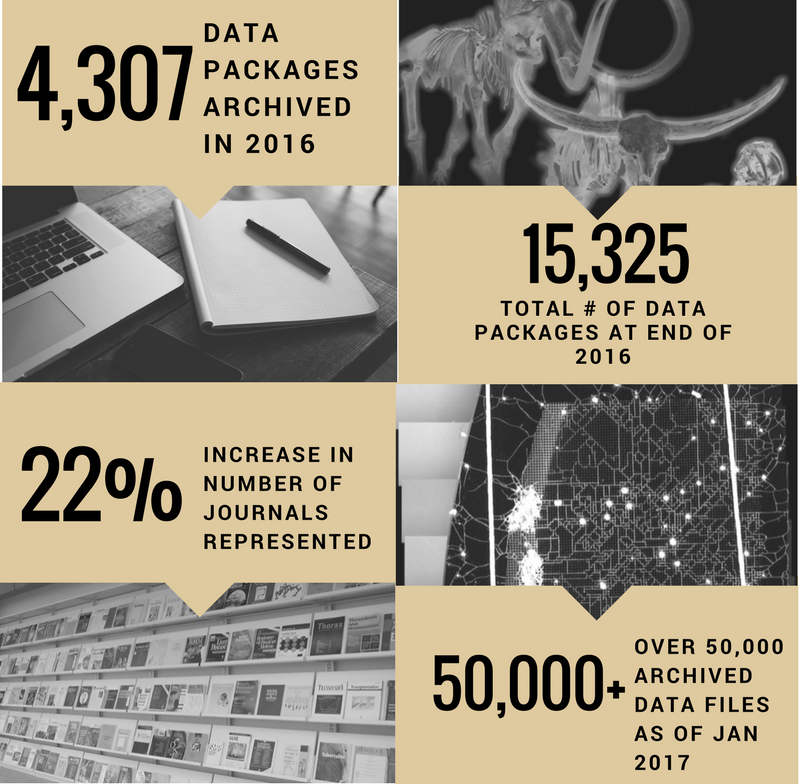 The total number of published data packages (sets of data files associated with a publication) at the end of the year was a whopping 15,325. Our curators meticulously archived 4,307 packages, a 10% increase from 2015. The size of data packages also continued to grow – from an average of 481MB to an average of 573MB, an increase of about 20%. At the end of 2016, we were closing in on 50,000 archived data files; by January of this year, we passed that mark. In a future blog, we’ll talk about the integration of new journals into the Dryad submission process, new members, and new partnerships. For now, we’ll just note that there was a 22% increase in the number of journals that have data in Dryad linking back to the article. We’ve seen a significant uptick in human subjects data and social media data this year, which has prompted us to develop an FAQ on cleaning and de-identification of human subjects data for public access. As the idea of what data should be preserved continues to broaden, submissions of these kinds of data will only increase. We’ll keep you updated about this trend in future blogs. Let’s take a look at the most popular data published in 2016, in terms of downloads. Among the top 5 downloads includes data on plant genetics, the early history of ray-finned fishes, and, not surprisingly in this age, the effects of climate change on boreal forests. Also of interest are data from an article in Science evaluating how people make use of Sci-Hub, an open source scholarly library. Our guest blog on these data by science journalist John Bohannon generated a lot of interest this year and was one of our most popular blog posts ever. Another significant development in 2016 came from the medical sciences. A comparison of coronary diagnostic techniques marked Dryad’s first submission from one of the top five cardiology journals, JACC: Cardiovascular Interventions. The fact that 2 of the 5 top downloads come from fields outside of life sciences clearly indicates that data in Dryad now cover a broad range of fields. Overall, we’ve had a great year and are delighted to be seeing a broader range of data from an increasing number of journals and fields. Thanks to our Board of Directors, members, and of course our staff for providing their support to make 2016 a notable year for Dryad!